After I got out of the hospital, I teleworked for while, then went to the office twice a week. 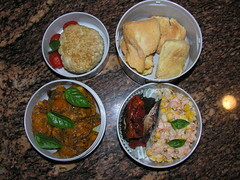 I bought Mr. Bento so I wouldn't have to go upstairs to the cafeteria or out of our office building for lunch. Great news, this week I'm going to the office three days in a row. More Mr. Bento usage! Upper left is a yaki genmai onigiri (toasted brown rice ball). I made the onigiri. Upper right are kichels my mother-in-law brought to us from Florida for Mother's Day. Bottom left are roasted tomatoes.. The roasted tomatoes are from Wegman's "olive" bar, as are the marinated portobellos with peppers on the bottom right. Also on the bottom right is shrimp and TJ's roasted corn with mayo and Old Bay for seasoning. The basil is from our deck garden, so I put it on everything, except the kichels.